(OPRAH.com) -- Oprah Winfrey often says that moms have the hardest job in the world, but plenty of fathers carry the burden of raising a child all by themselves. In fact, 2.5 million single fathers in the United State are doing it all-- juggling schedules, putting food on the table and going to school plays or soccer games -- single-handedly. 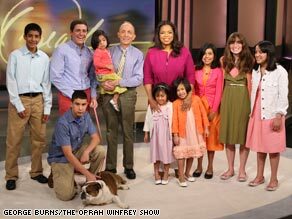 Larry Shine and his expanded family visited Oprah Winfrey on her show. Larry Shine and his wife, Kate, had their first son, Henry, 19 years ago. When Kate died of cancer only two-and-a-half years later, Larry says he was overwhelmed with grief. "The year after she died, I was just so immersed in the tragedy of her death," he says. "Then I thought: 'I can't live like this anymore. I can't have this be our life.'" He decided it was time for Henry to have a sibling. At the time, it was almost impossible for a single male to adopt in the United States, so Larry applied for both international adoption and surrogacy. Surprisingly, both applications went through, and soon Larry became a father of three. Still, he says he was ready for more. Today, Larry is raising nine children on his own! When it comes to raising nine kids (Henry, 19; Ari, 16; Halle, 15; Eli, 13; Lili, 12; Sofia, 10; Genevieve, 8; Simone, 5; and Lucia, 3), Larry says there is never a dull moment. His schedule is jam-packed, and it starts at 3 a.m.
As if being a single dad isn't enough work, Larry also works full time as a corporate attorney. "When the second bus picks up the younger kids at quarter of nine, I leave and drop Lucia off at daycare. Then I go to work all day and come back and pick her up when daycare closes at 6 o'clock and then head home," he says. "[I work at] a very warm and family-oriented firm, so they're very supportive." Though Larry's big family is thriving, he says there were a few small bumps along the way. Eli's arm broke when he was an infant and hadn't healed properly before he joined the Shine family, but Larry says extensive orthopedic surgery fixed the problem. Lili had failure to thrive syndrome, which caused her to have trouble connecting with others -- though Larry says she opened up after three months in his busy house and is doing great. And, Simone's speech was delayed, he says. "She had therapy for about six months, and now sometimes I wish I hadn't given her speech therapy," he jokes. Is there room for any more kids in the Shine family? Depends on whom you ask! "I thought five was it, and I thought six was it," Larry says. "My sense is that nine is probably it ... because international adoption's a lot more difficult, and I'm older. ... [But] I've been given a lot of opportunities, and if it happened again, I'd have a hard time saying no." Henry, who is a sophomore at Notre Dame, says the family is at capacity. "We're at a pretty full limit right now," he says. "Now that I'm in school, I'd like to be around if there's going to be another sibling." Though he's rooting for Lucia to be his youngest sibling, Henry says he's incredibly proud of his dad. "Just how selfless he is," he says. "I don't know of anybody else who puts people before themselves like he does." Though Larry didn't plan on being the single dad of such a huge family, he says it came naturally to him. "I'm more comfortable doing something for somebody else than myself," he says. "Particularly with adopting the kids overseas, when I went to Paraguay for the first time to adopt Ari and saw all the kids who didn't have a home and or a place to go at night, I just thought, 'This isn't right.'" On March 25, 2008, Matt Logelin woke up to what should have been a perfect day. He and his wife, Liz, were proud new parents -- their daughter Madeline had been born the day before. But that afternoon, Liz died of a blood clot that no one knew she had. With a newborn in his care, Matt had no time for mourning. "Right after Liz died, I had to go straight in and I had to feed her (Madeline). I mean, she had to eat. I had to change her diapers. Life didn't stop when Liz died," he says. "I didn't know what I was going to do. I literally didn't know if I was going to live through this." Matt and Maddy survived the tragedy, and Matt used the blog he'd created to document Liz's pregnancy as an outlet for his grief. "If I write it, I can get it off my chest," he says. After Liz's death, tens of thousand of people started reading Matt's blog. The outpouring of support -- including notes, money and toys -- from the online community shocked him. "To have total strangers giving us stuff and wanting to make sure we're okay all the time was just incredible," he says. Matt says he's determined to give back as much as he's been given. "We've donated all of the clothes that no longer fit and the toys that we couldn't use," he says. "We've been given a lot of money as well, and we've tried to give that away as much as we can." Matt has also established the Liz Logelin Foundation, which helps widows and widowers with children. A year after Maddy was born, Matt's still adjusting to life as a single parent. He's even joined the neighborhood new moms group. "They sort of adopted me," he says. "They took me in and made sure I wasn't screwing things up too terribly." Matt says one of the scariest things about Liz's death is that she took all her parenting knowledge with her. "Liz had read all the books. She had done everything that we needed to do to make sure that this baby was taken care of properly," he says. "It's not something I ever anticipated doing on my own." Matt says he'd planned to be the free-spirited parent, while Liz would be the rigid one. Given the circumstance, Matt has struck a balance. "I've had to be a little more strict in the way that I do things, but I still let her eat sticks and leaves from time to time." Oprah.com: Meet more unforgettable fathers!